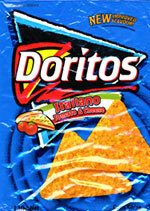 Taste test: These are another new addition to the Australian Doritos line, and once again Doritos has created a good flavor. I was a little dubious at first, as sometimes the experiments into other flavors can end badly (especially when the flavor includes tomato, for some reason) but these are pretty good. Smell test: A cheesey, tomato aroma.